Meet Florian, one of the founders of Four Frogs. He is our Operations Director, and you’ve probably seen him around – behind the crepe pans or on the floor! When did you start thinking about opening a creperie in Sydney? When I arrived in Australia from Bretagne 10 years ago, I soon realised there were no good creperies in Sydney. It was a logical fit for me to combine my experience in the food industry with my crepe making skills so I could bring traditional French crepes to Sydneysiders. After two years of refining my product, I was happy with the quality and authenticity. My three friends and I (the Four Frogs) were ready to open our first creperie in Mosman. Do you work in the kitchen, or on the floor? When Four Frogs launched, I was working full-time in the kitchen to train our crepiers (crepe makers). Every creperie uses different recipes and techniques – even very experienced crepe-makers need to familiarise themselves with the unique Four Frogs methods and processes. Today, we’re fortunate to have an amazing team of dedicated, passionate crepiers, so I only work a few shifts per month in the kitchens. I like getting to know our customers and I mainly work on the floor. I divide my time evenly between the three creperies. What’s next for Four Frogs? At this stage, we want to reinforce our reputation as being the best, most authentic restaurant for traditional French crepes and galettes in Sydney. We also want to make sure our customers and community understand what sets us apart – which is, in particular, our focus on creating our products and ingredients in-house. For example, we mill our flour in store, we handmake our milkshake syrup, and all our crepe mixes are made by hand every day, with only fresh ingredients. We have our own specialty Four Frogs coffee blend. We’re also planning to open the fourth Four Frogs Creperie somewhere in Sydney soon – watch this space! I take a lot of satisfaction in seeing our customers enjoying our crepes, and that’s what motivates me every day. We are in a very challenging, competitive industry – so, we have to be obsessed with our products, or we’ll be gone quickly! Life’s not just about work – what do you do when you’re not at Four Frogs? My wife and I love the Northern Beaches, and we live in Narrabeen with our two girls, aged 4 and 6. We have a lot of outdoor hobbies – surfing, running, trekking, swimming, snowboarding … we’re lucky to live in such a beautiful part of the world. 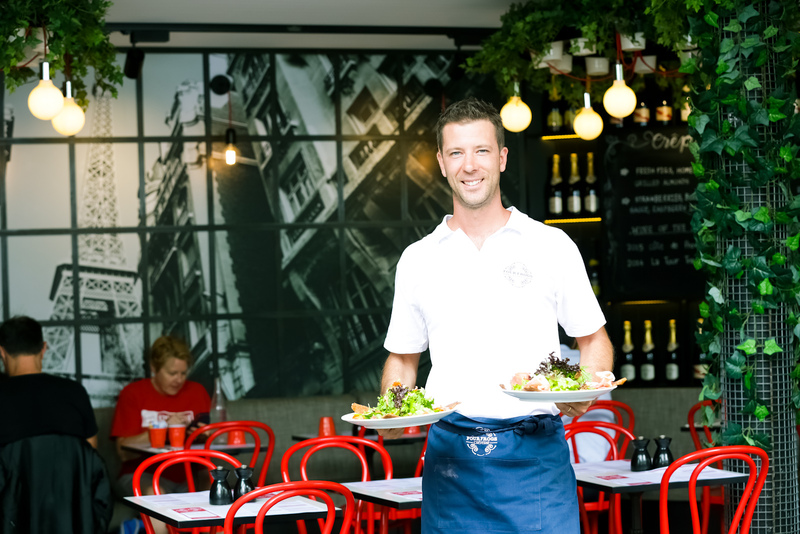 Four Frogs Creperie offers delicious, authentic French crepes in Sydney’s north shore, eastern suburbs and CBD. Learn more about our French creperies.